Philoxenia Hotel with its distinctive traditional architecture lies on a hill, surrounded by area pine trees. It offers wonderful view to the sea, the mountains and the city of Kavala. Each room is well-furnished and appointed with air conditioning and a private balcony and you can keep in touch with friends or work with free Wi-Fi. It also has a lovely terrace, ideal for relaxing with a drink and admiring the view. In the lobby there is a spacious café-bar offering free Wi-Fi internet access. 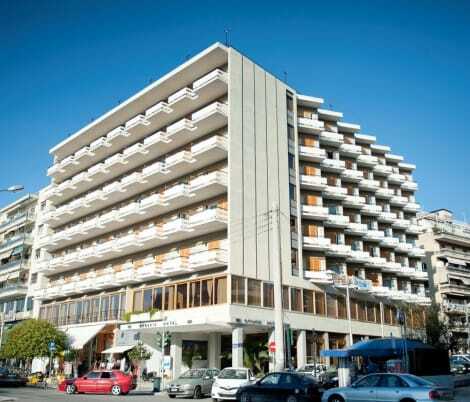 It is located 10 minutes from Kavala’s centre and 32 km from the Kavala International Airport. The hotel is easily accessible through the New Egnatia Highway, and within walking distance from the new hospital of Kavala. The old town of Kavalas and the museums are close to Philoxenia Hotel. The ancient town of Philippoi is just 17 km away. Make yourself at home in one of the 149 air-conditioned rooms featuring refrigerators and plasma televisions. Complimentary wireless Internet access keeps you connected, and satellite programming is available for your entertainment. Private bathrooms with bathtubs or showers feature complimentary toiletries and hair dryers. Conveniences include laptop-compatible safes and desks, and housekeeping is provided daily. Located in Kavala, Lucy Hotel is by the sea, within a 15-minute drive of Municipal Museum and The Castle of Kavala. This 5-star hotel is 2.3 mi (3.6 km) from Archeological Museum of Kavala and 9.3 mi (14.9 km) from Philippi Archaeological Museum. Treat yourself to a stay in one of the 26 individually decorated guestrooms, featuring fireplaces. Complimentary wireless Internet access is available to keep you connected. Conveniences include phones, as well as safes and desks. Grab a bite to eat at one of the hotel's 2 restaurants, or stay in and take advantage of the room service (during limited hours). Snacks are also available at the coffee shop/café. Relax with a refreshing drink at one of the 2 bars/lounges. A complimentary buffet breakfast is served daily from 7 AM to 10:30 AM. lastminute.com has a fantastic range of hotels in Kavala, with everything from cheap hotels to luxurious five star accommodation available. We like to live up to our last minute name so remember you can book any one of our excellent Kavala hotels up until midnight and stay the same night.